Blue Nankeen is the British name of the indigo cloth found in China, dating back since the silk road. Nankeen being the old name of Nanjing that was famous for its textiles. The Chinese name for blue nankeen is lan yin hua bu, which means blue-printed flower cloth. This related to that many of the patterns have flowers. Other prints are simple and geometric, and despite being centuries old they look surprisingly modern. Traditionally, the fabric was a common gift to newly wed couples and pregnant women. The prints would have a story attached, so as to bring luck or provide protection against evil. The color indigo was named after the indigo dye derived from the plant Indigofera tinctoria and related species. Commonly used today in China is lialon plant (Polygonum tinctorium). The plant is harvested in mid October, both leaves and tender twigs are used for the making of the dye. The process of making the dye, then takes several months. Hand-carved stencils, originally made from wood but now from heavy paper, are prepared and a mix of soya bean flour and slaked lime is applied through the openings of the stencil onto the 100% cotton fabric. When dry, the fabric is then dipped numerous times into the large tubs containing the indigo dye. The more times, the deeper the blue color. For the deepest blue colour, the average is ten dips. After the desired color is achieved and the fabric has sun dried, the paste is scraped off, revealing the white patterns on the blue cloth. The fabric is then washed, dried, and ironed before fabrication. Once dyed the deep blue colour is so colourfast that it can last for centuries, as evident in textiles dicovered in archelogical sites. The indigo fades with time as a result of wear, but never loses its hue completely. 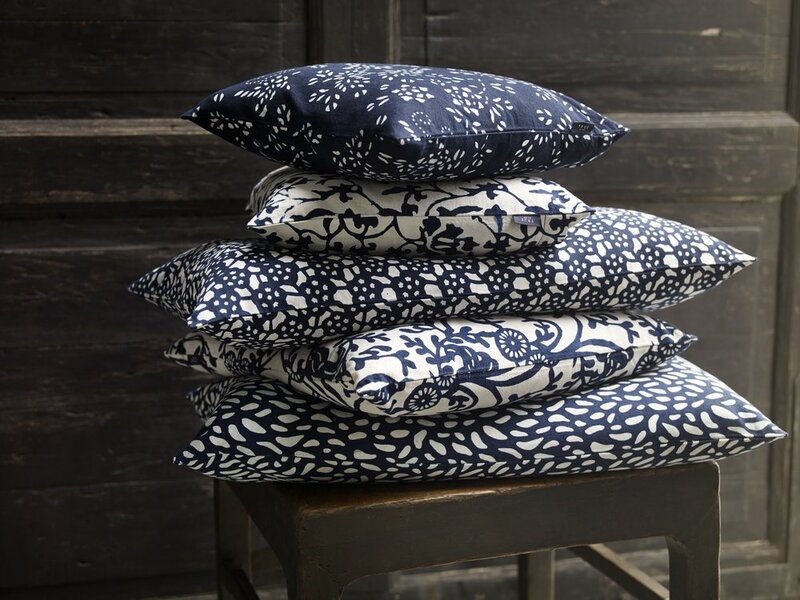 True Blues pure cotton indigo textile collection is for everyday home life. The fabrics have been tested and passed the high standards of SGS for chemical and pesticide contents. Washing in 40 degrees is recommended. Since the process involves several steps of washing, before, under and after the dyeing process, expect no shrinkage. The fabrics are extremely colourfast. Since the printing is made by hand, there might be slight nuance differences between different batches.